Robin & Starfire. . HD Wallpaper and background images in the 틴 타이탄 club tagged: teen titans titans teen robin starfire. This 틴 타이탄 photo might contain 애니메이션, 만화, and 만화책. Robin and Starfire look soooooooo good together! Cool but I dont like the picture of Night Wing and Star. Het next time keep that opinion to ur self u could be hurting Starfire luvers everywher.Anyways I think all these pictures are very very sweet Starfire and Robin is one of my favorite couples. i hate Starfire !!!!!!!!!!!!! she is monster!!! and robin ....it is so beutiful but no so smart.because ''love'' Starfire!! OMG I LOVE THIS SHOW,PIC,AND COUPLE!!!!!!!!!!!!!!!!!!!!!!!!!!!!!!!!!!!!­!!!­!!!­!!!­!!!­!!!­! 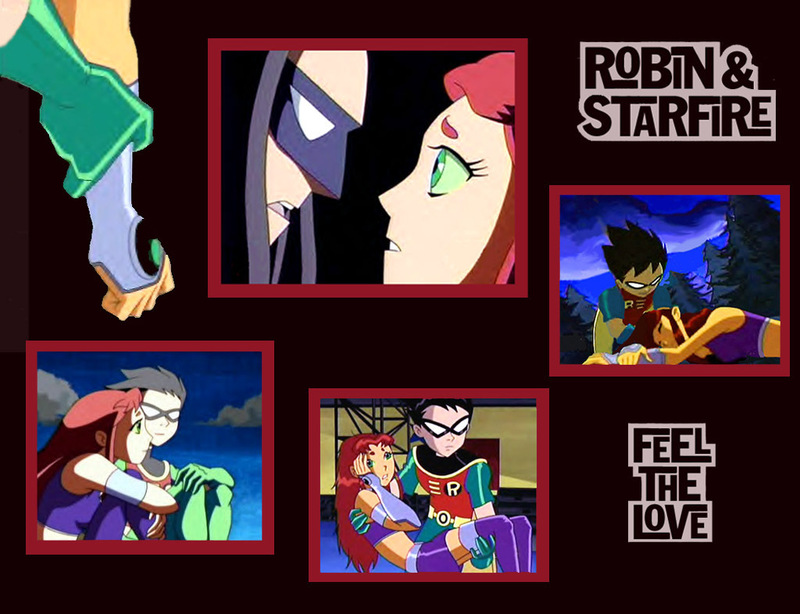 starfire and robin r meant to be its a fact of life! Sure Robin and Raven flirt sometimes but she comes no where near to what Robin feels for Starfire. Sharia13! I love your profile pic!!! And I love these pics! But I don't think that Nightwing should be with Star. Robin would be so much better!!!! What's the episode of the third photo? (the one under the words 'Robin and Starfire') pls reply soon. If you don't like the characters in the picture, don't click on it. No one's forcing you to. Go check out pictures of characters you like. You don't need to bash characters in front of people who admire them.